Sweet bakery is becoming an increasingly large proportion of what we do with innovative products such as our Scioche® providing customers with a unique point of difference. Our Guernsey Gâche (pronounced gosh) is also well worth a try for it’s luxurious buttery flavour. The best thing ever to happen to afternoon tea but a spectacular treat at any time of day. Our famous creation combines the best of scone with the best of brioche and now, daintily petite. The latest addition to our award-winning brioche family. Enriched with free-range eggs and butter, our hot dog rolls work well with a worldwide range of street foods, light bites and foods to go. These sliced brioche loaves make the perfect accompaniment to terrines, pates or they can be used to create the ultimate mushrooms on toast. Each slice is the perfect thickness for toasting and gives chefs ultimate control over portion sizes. No more uneven slices or cut fingers! A new twist on the traditional fruited teacake, our chia and sultana brioche offers something a bit different for customers looking for a tasty fruited bread. They work well either toasted or untoasted and can be topped with fresh fruit for a filling fruity afternoon treat. A new product deserves a new flavour so we created this fantastic addition to our range. Made with lemon and packed with poppyseeds there are lots of ways to use this product. Beautiful when served with clotted cream, lemon curd and topped with blueberries but it also lends itself well to being served toasted and topped with crabmeat or scallops and chorizo. The original Scioche®. A glazed top, packed with a generous amount of fruit and a buttery inside, this is so much more than a scone! Either split and top with cream and jam or toast and serve with stewed fruit. As we don’t use any preservatives in our products we recommend that our Scioche® are eaten the same day just as you would with a homemade scone. Our beautiful pepper brioche buns have that classical rich and tender brioche crumb thanks to their generous egg and butter content. Enriched with spicy, tangy pepper, they make a splendid accompaniment to all sorts of savoury meals. They’re the glittering star of many a fine burger and make a marvellously posh sandwich. A stylish hand finished rustic roll. A version of our popular brioche bun made with free range eggs and butter great to fill or to compliment any meal. A free range egg & pure butter glazed brioche bun complete with nutty flavoured sesame seed topping. Just right for those gourmet burgers. A refined and classy hot dog roll for those special occasions when only the best will do. Made with free range eggs. With 100% free range eggs and pure butter, our large brioche hot dog rolls are sweet, buttery and light. Ideal for those special occasions. Generous amounts of egg and butter make our mini brioche slider rolls rich, light, puffy and buttery, with just enough sweetness and a super golden crust. A fruity regional bread from the Channel Islands. Our beautiful pepper brioche buns now come in a smaller, lighter option and have that classical rich and tender brioche crumb thanks to their generous egg and butter content. Enriched with spicy, tangy pepper, they make a splendid accompaniment to all sorts of savoury meals. They’re the glittering star of many a fine burger and make a marvellously posh sandwich. Very refined and classy burger bun for those special occasions when only the best will do. Made with free range eggs. A delightful cross between bread and cake, our brioche has a soft centre, tasty crust and slightly sweet flavour, created with free range eggs. 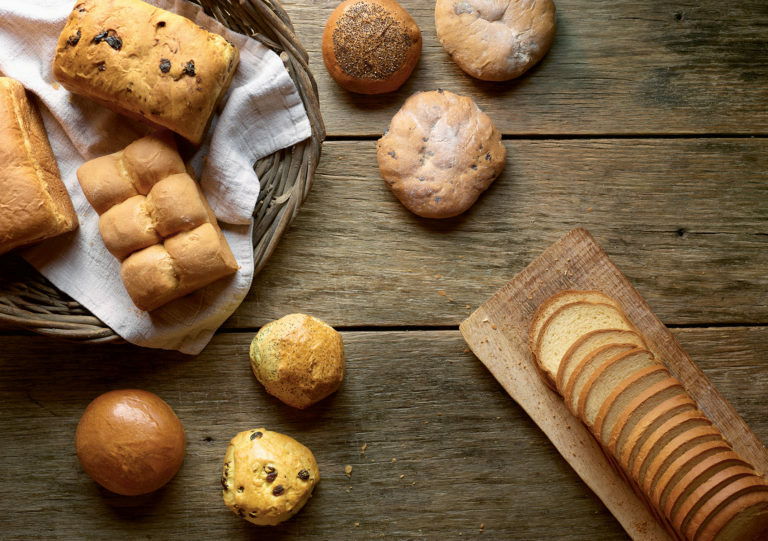 All our brioche, small or large, loaf, roll or mini have a generous butter content (sometimes more!) and are made with free range eggs. Now you know just why they taste so so good. An exceptionally rich and delicious cross between bread and cake.This authentic French recipe loaf will add a touch of class to any menu. Made with free range eggs. This authentic butter brioche is perfect served warm for a continental breakfast or with preserves for afternoon teas. Made with free range eggs. This luxury version of our traditional teacake is bursting with sweet cranberries giving a terrific taste. A generous 5" teacake with a light crumb and crust. Perfect for toasting.